I am thrilled to be working with the Nixi Potters again! We met for a reunion on the Tibetan Plateau in late October. 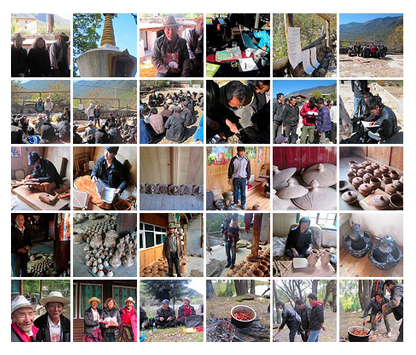 Aid to Artisans is pleased to announce The Nwang Choephel Fellows Award for 2012-2014. The Professional and Cultural Exchange will be conducted with Nixi Potters from Diquing Prefecture, Yunnan, China, and is being led by ceramic artist and designer Kathy Erteman of New York. The Professional Fellows program supports international cooperation and builds networks of people and organizations working on critical issues worldwide. During this two year program with Aid to Artisans,The Nixi Potters will gain first-hand experience by working alongside their American counterparts. We will announce opportunities to participate in public events. View the setting, click here. The studio sale Dec 8 & 9 was exceptionally festive and lively this year. So much that I forgot to take photos of the big crowd ! 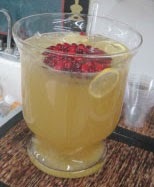 Maybe it was the exotic sparkling punch we made. Now back to work for what is shaping up to a full new year. In January 2012 "18th Street Dinnerware" I designed for Crate and Barrel will arrive in stores across the USA and I hope you will look for it. Those who had a sneak peek at the samples say that they look very much like my studio work ! 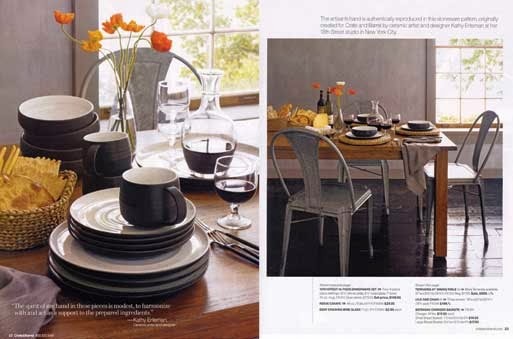 The factory in Thailand did an excellent job of capturing the essence of my handmade modern design. The past few months I have been working on large vessels and works on paper in preparation for my solo exhibition at Gremillion Fine Arts in Houston Texas, opening March 15th. www.gremillion.com I will post the details as I have them. I wish you an enjoyable holiday season and healthy, peaceful, and prosperous New Year.